State and federal funding is increasingly inadequate, so counties are having to pick up the transportation spending slack. As the expiration of the federal surface transportation funding law looms, counties may soon become responsible for the lion’s share of transportation spending. The National Association of Counties (NACo), recently released a study, The Road Ahead, County Transportation Funding and Financing, that took a look at the current responsibilities county governments hold in funding bridge and road infrastructure, and what that responsibility may look like in the future. The group found that currently counties are obligated to maintain 45 percent of the nation’s public roads. This includes 230,690 bridges. Additionally, counties are involved in nearly a third of the nation’s transit and airport systems. However, these maintenance costs are climbing, and the federal and state governments’ contributions is decreasing. According to the report, funding from federal and state highway sources for county transportation projects is increasingly inadequate. 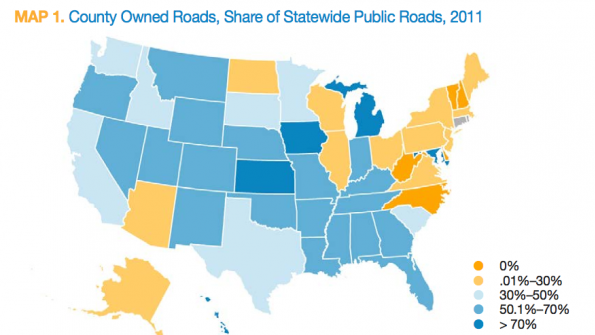 From 1998 to 2011, the share of federal and state funding for local government highway projects decreased 10 percent. The study found that while county governments own 43 percent of the federal-aid highway system, these governments receive a sub-allocation equal to 16 percent of MAP-21-allocated federal-aid highway funding. MAP-21, or Moving Ahead for Progress in the 21st Century, is the federal government’s surface transportation funding law. The causes for this lag in funding are varied, but the study found federal budget cuts, the recession’s effect on state governments and the fixed nature of the gas tax are main contributors. So county governments are increasingly being asked to do more with less. The cost of construction materials has increased 44 percent from 2000 to 2013, the study found, and regulatory costs have also rapidly increased. To adapt, counties have tried to implement additional financing programs, but these have not been sufficient to cover all needs. The report found counties are increasingly turning to local-option sales taxes to fund infrastructure projects, but many states do not allow counties to collect such funds. Resource pooling, particularly in Pennsylvania and Ohio has saved money on transportation projects, and for large capital improvement projects, counties are increasingly turning to public private partnerships. To get a visual representation of NACo’s findings, visit the interactive map, or to learn more about particular counties, listen to the webinar.